So I was casually paroosing my unread Google Reader items this evening. 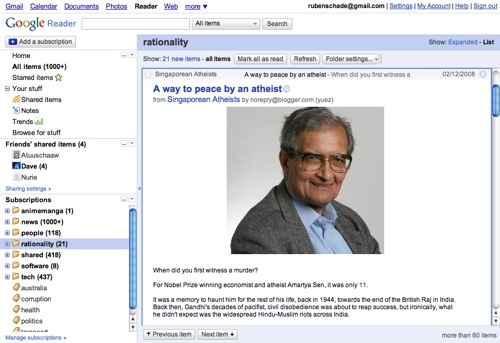 Upon eagerly clicking my much beloved rationality folder, the screen refreshed and the interface changed to an entirely new style, as you can see above. On the Reader team, we know that the old adage “change is good” isn’t always true. Sometimes, change is just change. In this case, we hope that these decisions both improve your Reader experience today, and pave the way for additional improvements down the line. 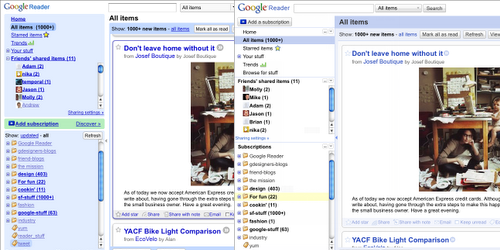 Do we like Google Reader's makeover? I can't speak for you guys obviously (if I did it would involve a great stretch and not caring whether or not I was being disingenuous!) but as for myself I'm somewhat underwhelmed, for the same reasons why I was somewhat underwhelmed with Google's Gmail interface upgrade. I am certainly not an authority on interface design, and I don't know enough about their backend to gauge the technical necessity of such changes (such as del.icio.us having to change their interface after their much publicised transition to PHP), but these refreshed interfaces seem more like change for the sake of change than anything constructive. I love the new interface, the colours really make the different sections stand out! Oh wait, that’s the old one? Whoa… that’s a regression. I do welcome the ability to collapse parts of the navigation sidebar, but as with Gmail I feel the removal of their trademark light green and blue colours to delimitate different parts of the interface is a huge step backwards. I thought the use of these colours in the past was a stroke of pure genius: they were low key and unobtrusive, and they separated content from navigation extremely well. These colours also acted as a consistent cross-application visual branding cue; when you saw those colours you knew you were using a Google service. I don't know why web companies are all of a sudden so petrified of using colour. As we saw with CNET America's revamping earlier this year, Google seems to think colour is somehow undesirable. In this case, they've replaced their trademark colours dull grey-blue shaded highlights; pale, almost invisible pixel-width lines; and heavy black text culminating in one generic wash of Blazing White™. Ever since I became a Gmail user back in 2004 when a friend of mine from high school sent me an invitation, I've held Google in the same high regard as Apple and the Xfce folks when it comes to user interfaces. When I hear Google is working on a new web application, I'm always eager to try it out because I know it will be slicker and easier to use than anything else on the market. I'm worried about this latest direction they're taking their interfaces though. I will keep using Google Reader because it's simply the best feed aggregator out there, but I do hope they allow a skinning feature similar to Gmail… so as I did in Gmail I can revert back to the original interface.